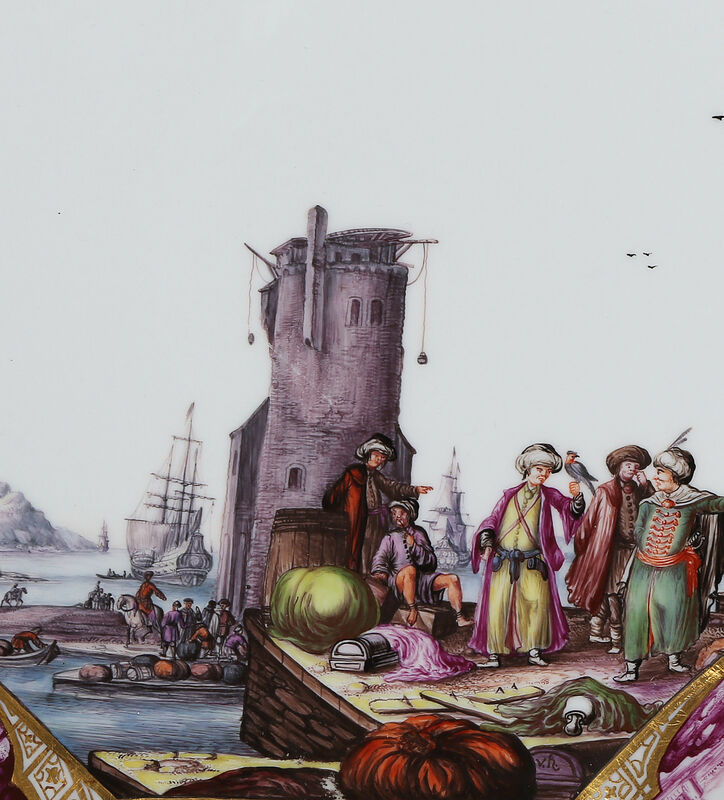 Decorated in the well with Turks in a harbour scene, beside ships and a tower. Initialled on one bale ‘v.h’. The cavetto and border with quatrefoil cartouches of figures in landscapes in polychrome and puce monochrome against gold scrolls, strapwork and diaper grounds. In one of the small polychrome cartouches an attendant wears a cap with an AR monogram. This service was virtually known until sixty-one pieces were offered for sale at Sotheby’s, London, in 1970. According to family tradition Samuel Christie-Miller had bought it around 1840 in Paris from a member of the Orléans family. 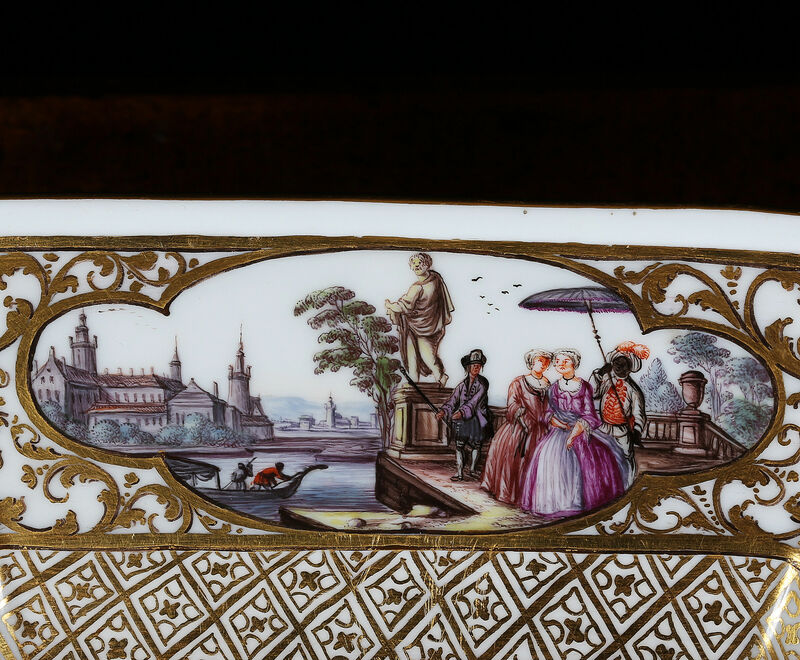 This is the most sumptuously painted of all Meissen services and decorated by the best painters of the factory including Johann Georg Heintze, Christian Friedrich Herold and Bonaventura Gotttlieb Häuer. The initials ‘v.h’ could refer to one of these. Although it is not documented for whom the service was originally commissioned, the exceptional richness of decoration suggests that it might have been a gift to the French Court by Augustus III, the Elector of Saxony and King of Poland, whose daughter Maria Josepha later married the Dauphin Louis Ferdinand. 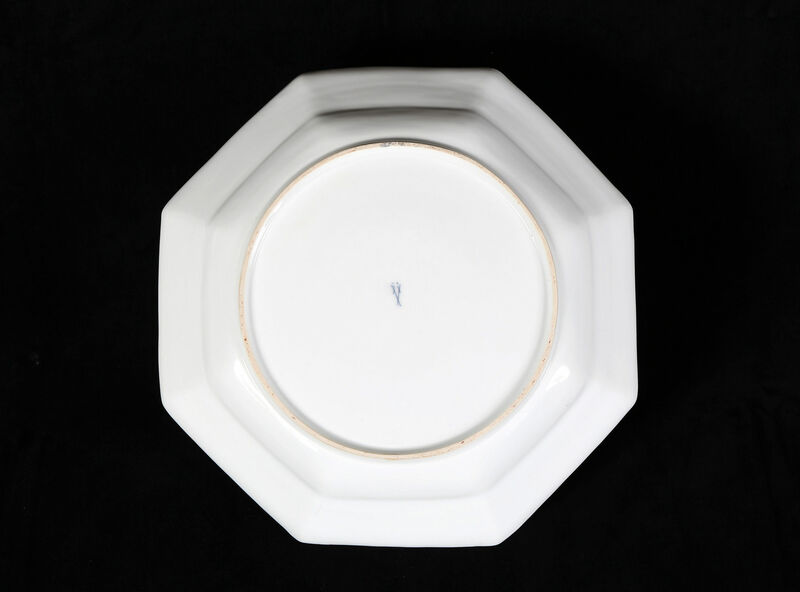 Before the Sotheby’s sale there were only two other pieces with similar decoration published: one dish of comparable size in the Museum für Kunst und Gewerbe in Hamburg (acquired in 1900) and a close variant, a plate, at the Victoria and Albert Museum. The three largest dishes of this service were in the Pfleuger Collection which is now mostly in the Museum of Fine Arts, Boston. 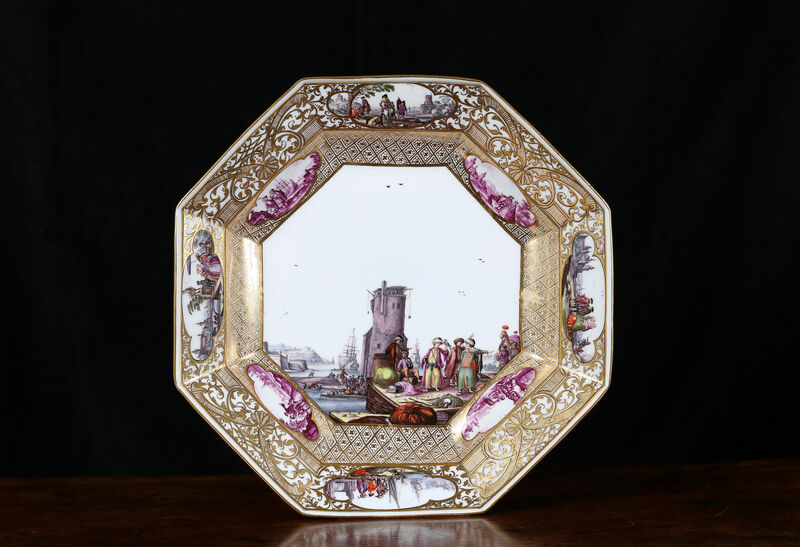 Apart from the one largest dish from the Pfleuger Collection which did not go to Boston, our dish is the largest one remaining in private hands.